More than one-third of all workers—38%—have no paid sick days. When these workers get sick, they are either forced to go to work, or stay home without pay and risk losing their job. 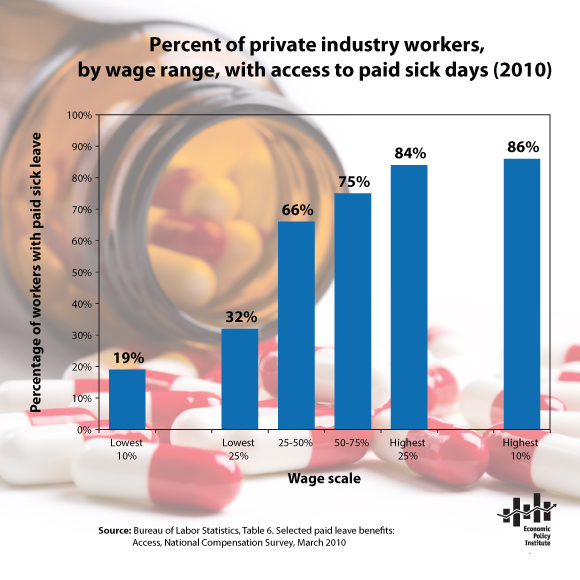 Access to sick days is also vastly unequal: As shown in the figure, workers at the top of the scale are more than four times more likely to have sick days than workers at the bottom of the wage scale. Only 19% of low-wage workers have paid sick days, compared with 86% of high-wage workers. These low-income workers are the ones who can least afford to lose pay when they are sick. A 2010 study found that the vast majority of nations (163 in total, almost all of them much poorer than the United States) guarantee paid sick days for workers. A law giving American workers that same benefit could increase productivity in the workforce through heightened worker loyalty, reduced turnover, and reduced workplace illness. This entry was posted in Healthy workers, Paid sick days and tagged Paid sick days, public policy. Bookmark the permalink.